Jack Daniel’s is a brand of Tennessee whiskey and the top selling American whiskey in the world. 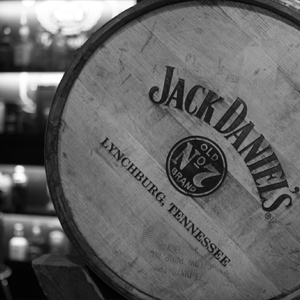 It is produced in Lynchburg, Tennessee, by the Jack Daniel Distillery, which has been owned by the Brown-Forman Corporation since 1956. Despite being the location of a major operational distillery, Jack Daniel’s home county of Moore is a dry county, so the product is not available for purchase at stores or restaurants within the county. The product meets the regulatory criteria for classification as a straight bourbon, though the company disavows this classification and markets it simply as Tennessee whiskey rather than as Tennessee bourbon. As defined in the North American Free Trade Agreement, Tennessee Whiskey is classified as a straight bourbon authorized to be produced in the state of Tennessee. Packaged in distinctive square bottles, a total of 11 million cases of the flagship “Black Label” product were sold in the company’s fiscal year ended April 30, 2013.